The double doors contain scenes from the Apostles Creed. 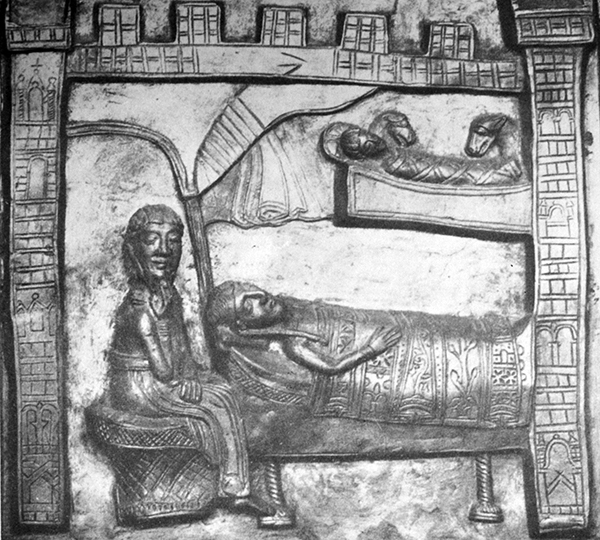 This scene is one of several from the infancy narrative used to illustrate article 3 of the 12 articles of Creed: “He was conceived by the Holy Spirit, and born of the Virgin Mary.” The Romanesque doors were cast in Magdeburg, Germany 1152-54 for the Plock Cathedral in Poland, which had been constructed 1129-44. At least since 1530 and quite possibly since the plunder of Plock in 1262, the original doors have been in the St. Sophia Orthodox Church in Nowogrod, Russia. In 1971-1981 these replicas were made and installed again in Plock.